One of the world-class theme parks, Legoland Malaysia was established and opened in the year 2012 at Johor Bahru welcoming more than visitors from all over the world with numerous exciting rides, games, and entertainments in the park. Legoland Malaysia in Johor is the first Legoland in Asia and also the 1st international park in Malaysia. The whole Legoland Hotel was designed with Lego concept, it was really cute and beautiful. It is a very ideal travel destination for families especially families with kids. Even better if you can complete your trip with at least 2 nights stay at the beautiful Lego-themed hotel! My last visit to Johor with my family was really a lovely one. Not only we did enjoy the trip very much, but we also booked our flight at a very cheap rate with AirAsia, one of the cheapest flights in the world which made our trip a perfect one! Air Asia ticket price is always the best when you are traveling around domestic or Asia. The are several room types available at the Legoland Hotel. I went with my family hence we picked 2 of the 4 themes and we really enjoyed the rooms. The rooms are quite large and it can accommodate 4 persons with breakfast. Furthermore, you will get rebates in theme park tickets when you stay with Legoland Hotel. Apart from all that, there's a little surprise awaits you in every room. You can find treasure box with password locks in every room, there's a quiz puzzle where you have to solve it and then you can claim prizes from the treasure box. So cute and exciting! The breakfast came with plenty of choices, there were too many choices that we can't really finish trying them all and the restaurant was really spacious that it can accommodate hundreds of people there. Legoland Malaysia has 9 theme parks in there including the Ninjago Park, Star Wars and there is also a water park inside there. You can spot Lego figurines everywhere around the park and take pictures with them. There was this part of the park that features signature buildings from all around the world. From there we can also spot also signature buildings in KL, all being very detailed and beautiful. The rides in Legoland are exciting and very family oriented. You can really enjoy your family bonding activities here, and I'm sure the kids will love it! Apart from kids' ride, the adults can also enjoy some exciting rides that will let you shout your lungs out too. There are certain rides with minimum height limits to protect the kids from injuring or any incidents. As you walk around the theme park, you will spot more Lego figurines that are cute and interesting where they purposely set them up for photography opportunities. Here are some silly things we did around the park and trust me, there are a lot more that I can't upload them all in this post. Other than that, there are many eateries and beautiful cafes around Johor too! I particularly love this one my friend brought me to located at Bandar Johor Bahru, the EHHE Art Cafe. EHHE Art Cafe is located at the old town of Johor and the building was really nostalgic. It looks almost like some heritage houses in Penang and really great to see how well they have maintained the building. Something you must try is the signature coffee specially created and it is something that you couldn't find it in anywhere else. They are famous for their hand brew coffee and this one will be paired with their homemade air-dried citrus, making your coffee smooth yet refreshing and I would say it is really interesting. Johor is a very interesting place and I will definitely be back again with friends and family! I have yet to explore so much about Johor and as I only spent 2 days and one night at the state. 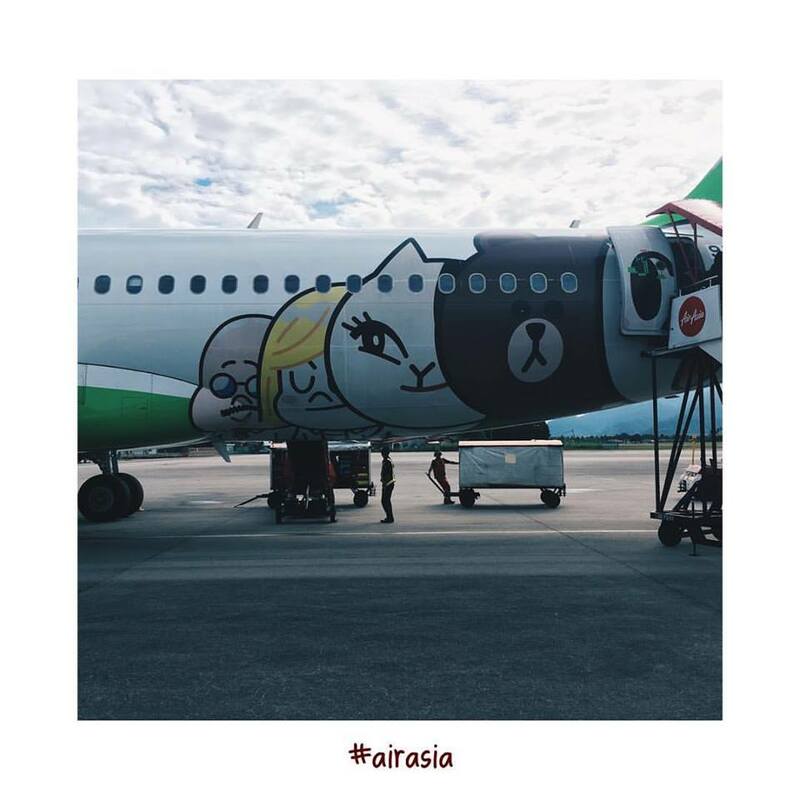 What surprised me more was the AirAsia flight that we took home was with Line cartoon design. I was really excited to see that and I'm glad that I flew with AirAsia, one of the cheapest budget airlines in the world. You can also choose to save more and save up your time by doing your booking through Traveloka, not only you can find the cheapest flights best price, but also you can see the honest price with no hidden charges as well as propriety solutions allowing for the most comprehensive flights and hotels offerings in Southeast Asia.